*Prices shown on this website are for land component only. (USD converted to AUD at time of tour payment). from FRANKO’S under our group booking arrangements. ...and go whenever you wish. *If you have a group of 12+ persons ...1 goes FREE! *Book as a group of 6+ persons ...and it's FREE DRINKS on the train! (Single hotel room - non sharing). *Consider that this is a fully escorted 18 Day tour (17 nights in Vietnam - incl Sa Pa and private overnight cruise on Ha Long Bay) with all meals and everything included; ...then add on the great advantage of relaxing travel aboard your own private train ...UNBEATABLE VALUE. Tour Dates for the 5 Star Deluxe version of our Rail Tours are totally flexible to meet your group preferences. A single group booking (4 to 10 persons) is required to confirm tour booking. Go as a group whenever you wish. PRICE: $85,000.00 for single group booking of up to maximum 10 persons. Go on ...ask the BOSS, or get a group together. Our 6 Day/5 Night Tours of Cambodia (CAMBODIA - The Past and The Present ) visiting Angkor, Ton Le Sap , Kompong Thom and Phnom Penh are ready to go when you are. You can take a Tour of CAMBODIA by itself, or in conjunction with an 18 Day Rail Tour of VIETNAM (before or after Vietnam), or maybe link a Tour of Cambodia with a Tour of LAOS ....completely flexible - any dates ...it’s your holiday! Easy to arrange. 4 Star Tour from $1180.00 pp/twin share …minimum 2 persons. There’s also our 4 Day/3 Night Tours of Angkor (The Glory of ANGKOR) visiting all the major sites within the ruins of ancient Angkor, plus a trip on Ton Le Sap lake. Our 7 Day/6 Night and 5 Day/4 Night Tours (LAOS - Jewel of The Mekong) are ready to go when you are. You can take a Tour of LAOS just by itself, or in conjunction with an 18 Day Rail Tour of VIETNAM (before or after Vietnam), or maybe expand it to include a Tour of CAMBODIA ....completely flexible - any dates ...it’s your holiday! 4 Star Tour from $1640.00 pp/twin share …minimum 2 persons. 5 Star Tour from $1840.00 pp/twin share …minimum 2 persons. 4 Star Tour from $1350.00 pp/twin share …minimum 2 persons. 5Star Tour from $1560.00 pp/twin share …minimum 2 persons. *Please note: Tour Dates for our SHORT STAY Tours are completely flexible. A minimum 2 persons can take a SHORT STAY Tour at any time. 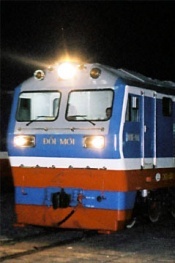 Option #1: Day trip from Saigon - returning to Saigon by late afternoon on same day. Option #2: 24 hour overnight trip - staying overnight in Vung Tau hotel.